Actors: when your director asks you to do this, refuse politely. DUSTY ERMINE — why IS it called that? — is an early thirties Hitchcockian light thriller helmed not by Hitch but by the considerably less-renowned Bernard “Mad” Vorhaus, celebrated for THE LAST JOURNEY in Britain and later THE MYSTERIOUS MR X in America. 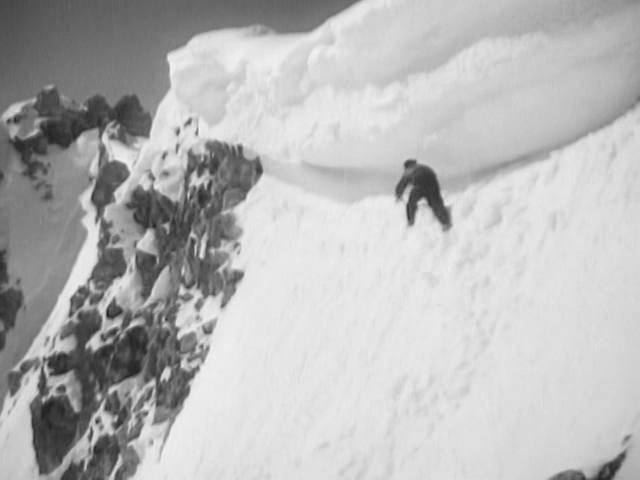 Helped by considerable, impressive and frequently dangerous-looking location work in the Swiss Alps, he makes a fun show out of a slightly rambling yarn about forged banknotes, a lovable ex-con uncle, and strong-willed filly and an equally pigheaded but rather incompetent Scotland Yard detective. I’d rate it as highly as a minor Hitchcock thriller of the same period, say THE SECRET AGENT (also Swiss-set in part). But what provides most interest is a couple of actors better known for later roles. 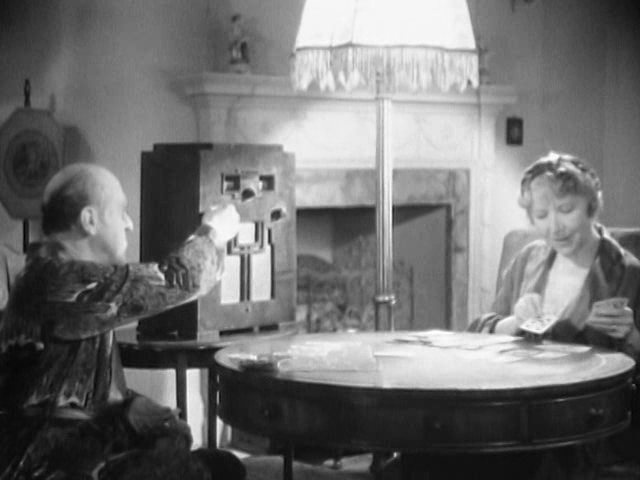 Katy Johnson, the tiny Mrs. Wilburforce from THE LADYKILLERS, looks much the same but is considerably sturdier. One always knew that Mrs. Lopsided had steel in her hunched old backbone, and she makes quite a formidable matron here, moving about with disconcerting speed and forcefulness. 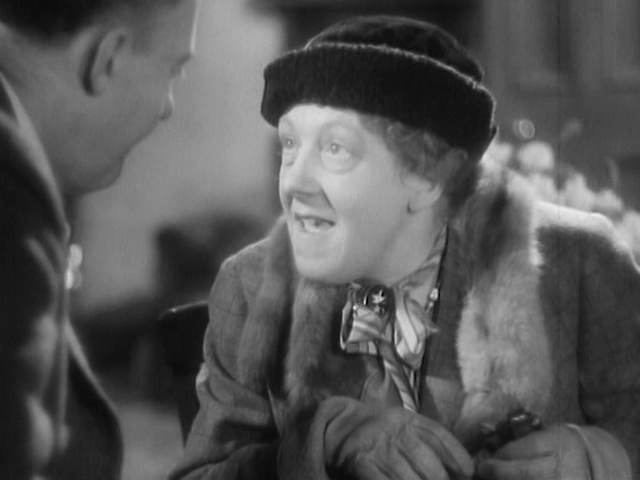 The chief villain — well, the shambolic story doesn’t quite have one, but a junior one with quite a bit of screen time is played by Margaret Rutherford, in her first credited role. It’s a surprise to see her as a baddie, so beloved was she in harmless eccentric roles from BLITHE SPIRIT on. Her method of adapting her particular instrument to this challenge is fascinating. Her habit of straightening her back and sinking her head into her “chest” while ringing her hands enthusiastically, can be performed, with only slight change of emphasis, so as to create a peculiarly disagreeable effect, cockroachlike in its repulsiveness. Perhaps what’s most peculiar is the thought that such strange posturings, in other films, are extremely appealing. I sort of recommend watching A COUNTESS FROM HONG KONG on a double bill with THE SHINING. As Kubrick’s spooky hotel seems time-warped back to the twenties, housing a whole temporally displaced dead population from that era, who eternally party, so Chaplin’s tuxedoed waltzers at the start and finish titles seem like refugees from the past — Chaplin wrote the treatment in the thirties as a vehicle for then-squeeze Paulette Goddard — presumably with himself in the Brando role. Now Sophia Loren is the Countess and times have changed, or have they? Intermittently mildly funny, but mostly just damned odd, this isn’t, to me, an unpleasant watch, but it’s a very queer one. Brando seems to have entered the picture with high hopes that this would finally be his successful comedy (with a master like Chaplin in charge, how could it not?). In fact, he’s funnier in BEDTIME STORY — also, Brando’s sense of humour is that he’s a goof, a face-puller, a prankster. Deadpan sophisticated farce isn’t quite his thing, but he enjoys his few moments of silliness — panicking at the door buzzer every five minutes — and the brazen vulgarity, of which there is much — belching, gargling, sea-sickness, and the unspeakable threat of toilet noises. Loren, who can do anything and is VERY funny in YESTERDAY, TODAY AND TOMORROW, is similarly patchy, managing some good physical stuff in a succession of outsized pajamas and dresses which deliberately recall her director’s baggy pants. But the film also veers into melancholy melodrama and she seems slightly more comfortable there. Brando apparently grew to hate his director, focussing his outrage on Chaplin’s perceived mistreatment of son Sydney, who’s quite good in an undercharacterized supporting role. Syd didn’t feel bullied at all, and thought Dad was just trying to help him be good. It feels like Brando withdraws a bit as the film goes on: he did have a tendency to stop trying when he didn’t feel appreciated or lost enthusiasm for a project. The same can’t be said for the magnificent Angela Scoular, who is consistently funny regardless of whether she has any comedy material to work with. Sadly, she only makes three little appearances and her role goes nowhere, plotwise. It’s Chaplin’s last film but her first, proving his eye for talent (and the ladies) had not deserted him. Also present, supporting Margaret Rutherford’s all-too brief turn, are Monty Python muse Carol Cleveland and a trio of Chaplin daughters, including Geraldine, who nails her cameo and gets a laugh with a lot less obvious caricature than the ebullient Scoular. The movie isn’t spooky like THE SHINING but there is something a bit disconcerting about its time-warped wrongness. It feels a little like a tribute to TRADE WINDS, the film Tay Garnett was shooting location stuff for when he bumped into the Chaplins in Hong Kong. I’m almost convinced Garnett blabbed about his plot and Chaplin made a mental note to swipe it. By the time he got around to it, the story had moved on but so had the world, and in opposite directions.